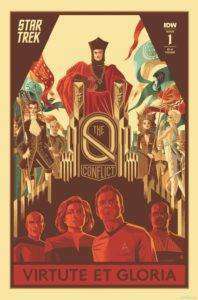 Solicit: When a dispute between godlike beings threatens the galaxy, it will take all of Starfleet’s best can’t to stop them. 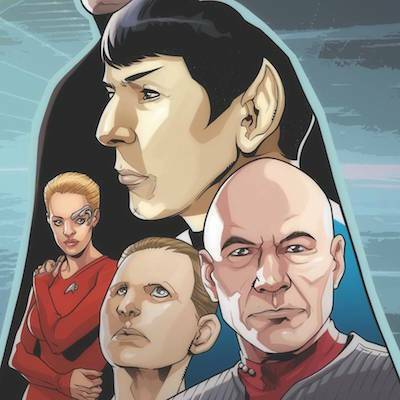 Join James T. Kirk, Jean-Luc Picard, Kathryn Janeway, and Benjamin Sisko as they go head-to-head in a competition that will determine the fate of the Earth and beyond. Will they be able to emerge victorious, or will they be torn apart by The Q Conflict? A soon-to-be-classic six-part miniseries begins here! Star Trek isn’t really a series known for being super action-heavy. It’s smart, dramatic, socially relevant, and very character focused. I’ve been a fan since I was nine years old. Trust me, I understand this. So while I wasn’t expecting The Fast and the Furious in space, it was still a bit of a let down that a comic that features all of my favorite characters coming together across time was kind of boring. Like in so many Star Trek stories, there’s an unexplainable anomaly that the Enterprise must investigate, shenanigans ensue. Or at least they begin to. Writers Scott and David Tipton deliver pages and pages of exposition, with panels of repetitious artwork. We get some fun moments, like when Picard discovers that Q is involved, and the eventual meeting of the four time lost crews. But the set up just keeps going on and on. David Messina is a very talented artist and he’s great at capturing likenesses. 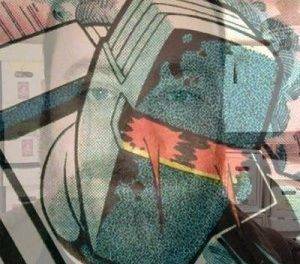 When there’s a close up shot of Captain Picard or Geordie LaForge, his work is spot on. But he loses some of that detail in the wider shots, and the only thing you have to tell characters apart is hair and forehead ridges. Messina also has trouble with some clunky poses. There are panels where some characters look like action figures with just a few points of articulation. And because this issue is so dialogue-heavy, it really stands out when Messina basically repeats panels multiple times, doing very little to make them visually distinct. I understand that this is just the first issue, things needed to be set up, and I’m still excited to see how it all plays out, but 32 pages of talking heads and some inconsistent art mean that The Q Conflict #1 gets a SKIM IT from me.